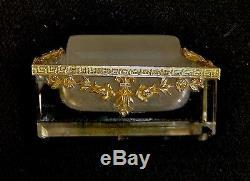 Rare old crystal humidifier for postage stamps. This humidifier consists of a frosted glass cylinder inserted into a crystal block. Nice brass decor on the borders and 4 faces. In order to use it, water was placed in the crystal block, and the cylinder was turned, which became moist and on which the face to be stamped with postage stamps was applied. All angles of the crystal part are beveled. Rare model of very beautiful manufacture. Empire period, this humidifier is in good condition, just to report on one end a rounded fillet that is seen little because it follows the movement of the cylinder (see photo red arrow) length: 7.6 cm width: 4, 3 cm height without the cylinder: 3.4 cm height with the cylinder: 4.3 cm free delivery neat packaging sending with insurance and monitoring. Click once on the images, then 1 second time to zoom. The item "rare former humidifier for 19th century empire crystal postage stamps" is on sale since Saturday, December 13, 2014. It is in the category "art, antiques, xixth century objects and before". The seller is "devirvillede de grolee" and is located at / in brive la gaillarde.